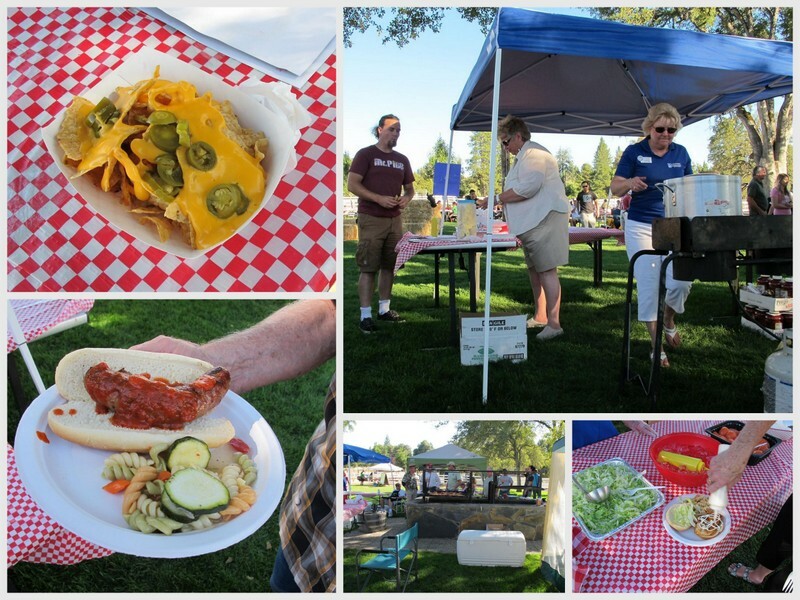 Last week was the run-up to the big Soroptimist Summerfest on Saturday. 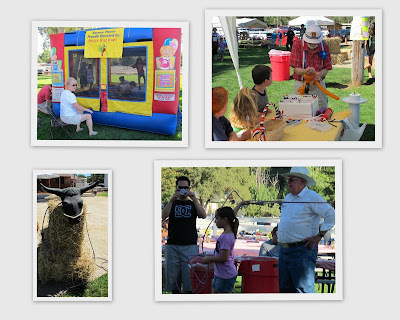 All hands were called on to turn out at the stables picnic grounds at 10 a.m. Saturday to set up for the event. The day started sunny and hot and only got hotter. Stables staff had set up seventy-some tables and I was on the committee to decorate them. Fortunately for the aesthetics of the tables, I wasn't in charge of figuring out the decor, and, in fact, I volunteered to work with the teams unrolling and taping tablecloths to the tables, while other teams put stones in bottles and added flowers. Others sorted and set up items for the various auctions . . .
. . . And barbecues and food booths and games, and the "saloon" where beverages were sold. "Get your food and game tickets here . . . "
grilled chicken sandwiches. We also had hot dogs and strawberry shortcake. Little tot looks on. He's just learning to walk. For the big kids: Classic cars. 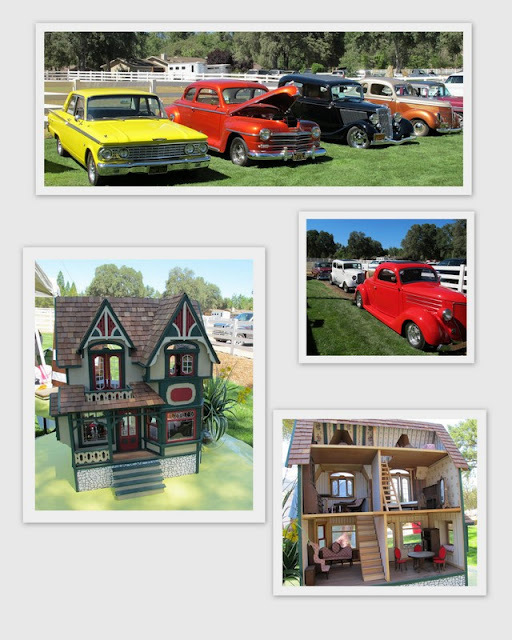 For auction: a hand-made doll house and furniture. Line-dancing instructor arrives . . .
Summerfest attendees had a good time, despite the very warm weather which may deterred some from attending. We do have good shade and breezes at the stables, so it's fun, cool or warm. It was all hands on deck again to "strike the set-up," and went home tired. Yours truly, the night owl, went to bed directly and then woke up too early Sunday morning, with three uncalendared days ahead of me. Whatever would I do? This is where a big breakdown between "shoulda" and "did" diverged. Here's the part where some burst of nostalgia triggered by this being Provence time of year reminded me that I hadn't finished a Facebook album of my Provence tour of 2011. Some of it I blogged about at the time, but I'd only put a few pictures up on Facebook. I really should have, I really intended to, vacuum up the cat fur and swirl a little dust around, since my lady who cleans is nursing a broken foot. I didn't even try on Sunday. I felt a day of "relaxation" was due. Get me into those digital photo files and I'm lost. I dove into it and worked all day until late that evening, finishing up the one album underway and continuing with another so the albums wouldn't be too large. Monday I intended to vacuum and first thing in the morning got a nosebleed with no particular provocation. Well, who can vacuum when a spontaneous nosebleed can break out at any time? So Monday allowed me to make corrections to the Part 2 album and do a Part 3. Today I had every intention . . . just check email and Facebook and do my Photo A Day for today and then pitch into the cat fur. Then there it was on Facebook, the August Photo A Day list. I've been participating in this monthly challenge since June and have been joined by several friends. An Australian blogger started Photo A Day by making a monthly list of daily prompt words for a photo a day, which can be posted on Facebook, which I do, or Instagram or other social and photo-sharing media I'm not familiar with. It's fun trying to figure out a new photo twist on a common word or phrase and compare it with everyone else's "take." 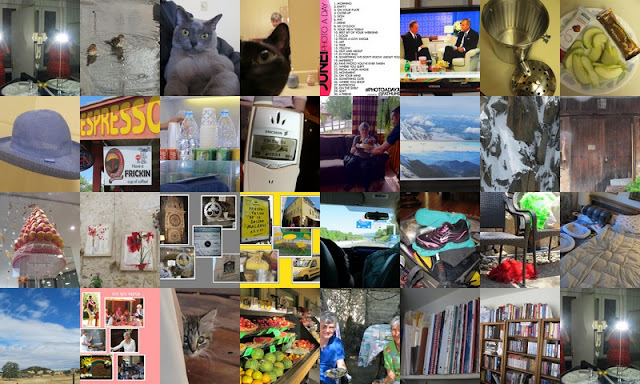 Well, that meant it is time to spread the word and find out new ways of sharing the photos and then get into "housekeeping" the photos that I used in June and July so far and searching for existing photos that it would tickle me to use as an illustration for some of the words. You can see I'm running on and on about it and that's how I use up a day. I decided to "collage" all the photos I used for the June prompts. Tomorrow. Jean-Luc gets to see the vet for his checkup and shots. And the cat fur remains? Soroptomists certainly had a variety of activities, I can understand the staffing requirements. Hope they made some money.How do you do that collage thing? 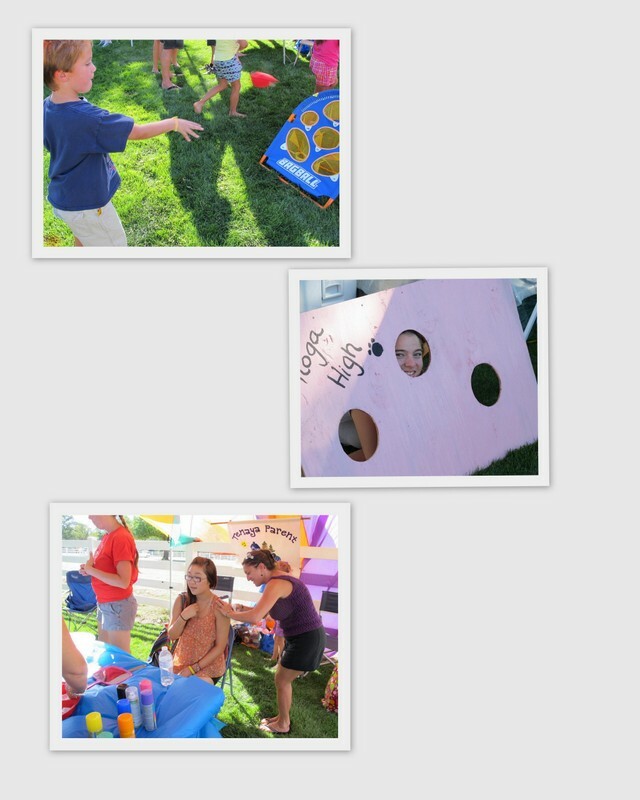 The collages were done on Picasa. I find it so hard to find anything on Picasa (old fashioned person who thinks in terms of a directory tree) but I stumble through "folders" until I find and select the photos I want to collage, then Create>Picture Collage. There are several stock arrangements and borders and paper sizes and shapes and other things I haven't explored yet. It's quicker to do than just putting photos in my word processor, which takes several more steps.